Gadwin PrintScreen lets you capture images from your computer screen. For example, you can capture the entire screen, individual windows to use as an illustration in a manual or on a Web site. Use Gadwin PrintScreen Pro to save time and enhance your screen shots! Gadwin PrintScreen Pro is an easy to use utility that allows you to capture any portion of the screen, save it to a file, copy it to Windows clipboard, print it or e-mail it to a recipient of your choice. There are several hotkey combos to choose from (PrintScreen is the default). Once you've chosen your favorite combo, head to the Destination tab and have the screen print out instantly, copy the capture to the clipboard, save it to a specific folder, or even send it through e-mail. You can perform full screen captures, or only capture a specific window. Gadwin PrintScreen Professional combines the power of a first-class screen capture application with an advanced image editing and annotation utility - wrapped into one easy-to-use tool. Gadwin PrintScreen Professional is versatile and extremely easy-to-use. PrintScreen Pro comes stocked with customizable arrows, blur, colorful speech bubbles, and more to mark up your screen captures. Work faster by saving your capture settings as a profile. Set up profiles to automatically remember capture settings, add effects, or send to a specific destination after capture. Screen captures can be used for many reasons. Use captured images from Gadwin PrintScreen to show off your product on the web. Enhance technical or sales documents and embed captures into presentations. Gadwin PrintScreen can help you capture and print or save computer screen data. - Full screen of data can be put only on the clipboard. 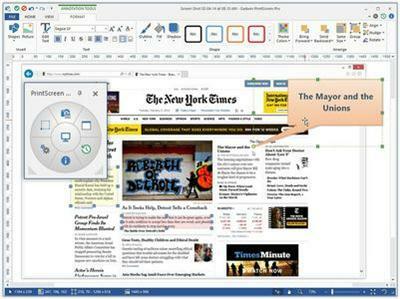 - It is either difficult or impossible to capture some elements of a Windows screen, such as different shaped cursors. - You spend too much time making image captures.